The challenge is to use that palette to create a mockup in those dimensions. Everything else is recommended but not compulsary. This a bit much for beginners. I'm not really sure what this means. See everyone again for next week's challenge. Thanks for transmitting all that info Ptoing.. Now I have a confident grasp or understanding on this. Also Dat Muffin Man, thanks for the link to an enightening thread that should be bookmarked by anyone curious about old hardware specs. I'm hoping to have some time to enter; can't say I will for sure yet. But I can say I will only vote for pieces which follow the restrictions to the T, so let's form a coalition of strict voters! Yes of course bigger "sprites" are multipe sprites. That is what a lot of what games on older hardware HAVE to do to get anything bigger than their max hardware sprite size. So you could say that most sprites on the NES are metasprites. The description says thet the sprite size is 8x8 or 8x16. But as I saw the NES character sprites, even the basic, small Mario sprite is 16x16, not to mention the grown up version wich is bigger (or even uncle Scrooge in Duck tales, who is more bigger). Is it possible, that they are made by using multiple sprite pieces? Just I cannot recall any NES games, that would use full 8x8 sprites for figures. The actual res is 240 hight, but NTSC screens were not all capable to show the full 240 so the middle 224 are the safe zone pretty much, which is what kinda got misconstrued as the actual resolution by a lot of people. You get 4 sprite and 4 tile palettes. 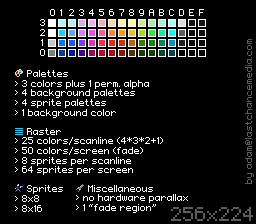 The sprite palettes are trans + 3 colours each, where the transparent colour is the 0 index of each palette (as in 0,1,2,3 = trans, col1, col2, col3). The transparent colour would be the same for each palette, but this colour is not transparent if used elsewhere. For the 4 bg colour palettes the 0 colour has to be shared among them all. So it is 1 shared + 3 for each. So that allows for a total of 13 bg colours and 12 colours for sprites. Which is how Adam got the 25 colours per scanline. The 50 colours per screen is kinda nonsense. Technically you can do more than 1 rastersplit (a vertical line after which you change the palettes or the deemphasis colour, could also be mid line technically), but this will be an impact on performance so there are not many games that did that. The only one I can think of is Noah's Ark. I think for this effect they switched to a special monochrome mode under below a scanline offset that is actually rising during gameplay, this monochrome mode only allows for 3 colours which can not be choosen. You can also see how 1 line is totally black, which is I think to mask the colours changing midline or something, timing stuff anyway. 1 permanent alpha = that color will be transparent in the game. 1 background color = the screen's background color. You will put the sprites on it. So basically in NES there wasn't a background image for the games, just one color (for example in Super Mario Bros the blue "sky"). Could someone explain why this is 256x224 as opposed to the 256x240 that this thread describes (scroll to kasumi's reply about the NES)? Also what is the difference between the "1 perm. alpha" and "1 background color" ? ||||: Haha yeah, I see what you mean. The one I linked is more accurate. Also in case someone does not get this. The palettes under the first 4 rows are deemphasis palettes which the NES could do as well (I don't think many games used this actually). skeddels: yep, Goodlyay is right. Multiple sprites. And most games probably use 8x8 sprites instead of 8x16, because you can not have both sizes at once, and 8x16 will not be good if you have smaller projectiles, because the empty space is still counted as occupying a scanline, as I mentioned earlier. Link was probably two sprites, then. I'm glad you posted Ptoing.. but I'm honestly even more confused due to that link. All the colors are different in it. The flicker thing is something that you have to program yourself. Though as long as a system has something like sprite IDs I don't think that would be a problem. Oh NTSC pallet. No wonder it looks so off. Also, already started working on an entry. Also not entirely familiar with how the Snes handles things. especially with the scanline thing. (since I know some consoles allowed for scanline flicker to make it seem like there were more sprites on screen for stuff like busy cities). So, going to keep it simple. @ptoing. Ah ok, thanx. (then I'll include this one among the hardware palette-presets in the next update of the Grafx2 Toolbox). Is it referred to by a specific name? Yes, only 8 sprites per scanline, and sprites are always 8x8 or 8x16 (all of them either or, can not mix sizes). So even if you have a sprite that is just a 2x2 pixel bullet or something (for sake of explanation here) it would still take up 8x8 pixels, the invisible pixels still count towards scanline occupation. It is possible to have more than 8 sprites on a scanline, but some sprites will just disappear, and to prevent this you need to code your own flicker routine. Awesome idea for a challenge. 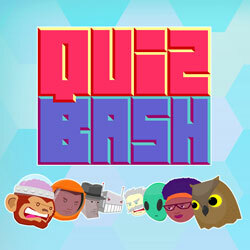 I hope lots of people participate. Guys its optional to fit the specs exactly. Get spriting! I think you can adjust the overall hue of the palette, like emphasizing reds/greens/yellows if needed. I could maybe join in... And while I want my entry to fit the NES requirements as much as possible, I sadly don't understand how do the Raster and "fade" rules work (except for the 64 sprites per screen one, which is obvious). I could probably look it up but I dunno where to start. 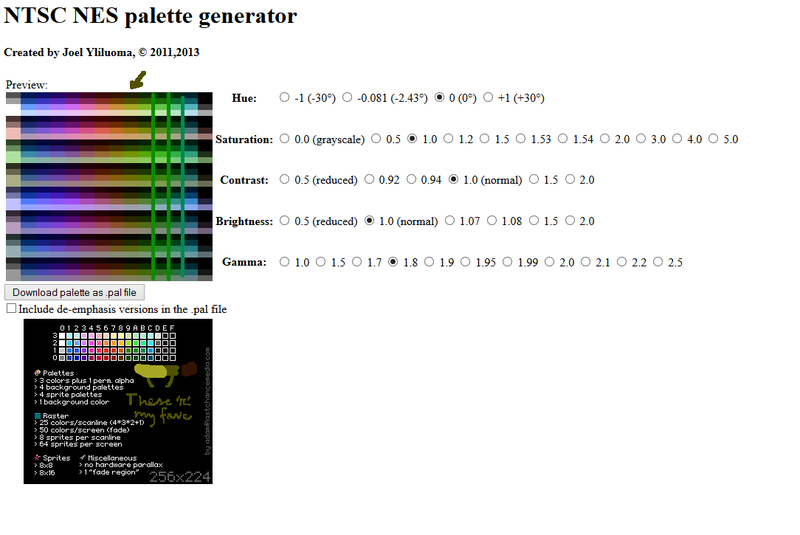 Yeah, this palette is wastly different from what I thought was the "official" NES palette (the one on Wikipedia). I know next to nothing about NES, so if some expert could light on the topic. I assume that the NES like the C64 is subject to interpretations, as |||| implied. But this one is way more different than any variation found in C64 palettes. And about sprites on scanlines; is the 8 sprite limit just the start/anchor line or may/can no line be occupied by more than 8 at any time? I'd just like to know about one thing. How many sprite and background tiles were there on the NES' memory? If I remember correctly, the graphic memory could be upgraded by chips in specific cartridges, so if you only mention the most common ones, it's fine. I don't see my 2nd favorite shade on the palette (which is that mustard yellow-green). This is but one of many NES palette interpretations I take it. It looks like the color I'm talking about is more of an orange in this case (color 1-8).